The Cuisinart CTG-00-BCR7 is barrel crock with 7-piece tools cookware set to decorate the kitchen. It has Soft-grip non-slip handles with stainless steel. 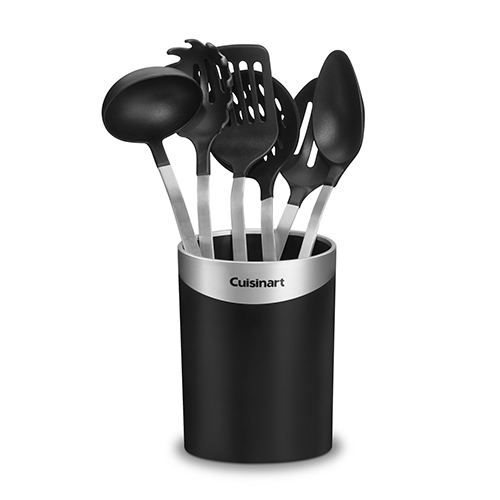 All sophisticated designed tools are dishwasher safe and can be used on non-stick cookware. Crock keeps tools within reach. The Kitchen Tool Crock With 7 Tools has many exciting features for users of all types. You can extend the lifetime of your Kitchen Tool Crock With 7 Tools with the purchase of a FactoryOutletStore Factory Protection Plan. See the Kitchen Tool Crock With 7 Tools gallery images above for more product views. The Kitchen Tool Crock With 7 Tools is sold as a Brand New Unopened Item.